The transmission is mounted to your engine to transfer the rotational force of your crankshaft to the drive axles. The MINI brand was the first to transversely mount the transmission to maximize interior space in their front wheel drive (FWD) subcompact cars. This transversely mounted transmission is called a transaxle. The transaxle has become the standard for many FWD vehicles today. 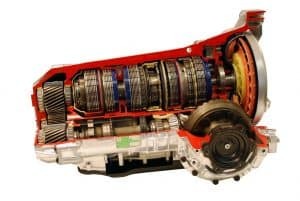 A transmission has a drive shaft that connects to a differential gearbox. The differential transfers varying degrees of rotational force to each wheel. A transaxle also has a differential but encased within the unit itself. A differential is necessary because each wheel rotates at different speeds while turning. Your differential may start to whine or wear prematurely if you fail to change the gear oil using the factory recommended brand or specifications. An electronically controlled transmission upgrades the valve body of mechanically controlled transmissions with computer-controlled solenoids. The solenoids activate various hydraulic circuits to divert pressure into particular clutch packs. The electronic controls also rely on speed sensors. The sensors provide data to the transmission computer in order to calibrate the ideal settings for particular driving modes. The benefits of an electronically controlled automatic transmission over the older mechanical dinosaurs are manifold in performance and questionable in reliability. The valves in the modern electronic valve body are made of a particular type of thermal-expansion plastic that expands as it is heated. This is necessary to retain ideal operating pressures because the ATF (automatic transmission fluid) thins as it is heated. Over time, these valves can become gummed up and sticky. Sticky valves or particles not caught by the filter can cause hesitation in shifting or entirely immobilize a vehicle. It is dicey to power flush transmission fluid. The problem is that flushing the fluid can dislodge particles that interfere with the sealing of precisely fitted hydraulic circuits. Many transmissions today are sealed and unserviceable because they are filled with a high-quality transmission fluid that lasts the life of the vehicle. When there is a problem with the transmission, it is cheaper to install a brand-new or remanufactured replacement due to the complexity of the systems and difficulty in shops repairing transmissions. A hydraulic transmission is the most complex piece of machinery in your vehicle and requires sterile lab-like conditions to service. Heat is the leading cause of transmission failure. The hot spots that were once common in the conventional dino oil that filled them would deteriorate under heat and be consumed by the volatility. Modern full synthetic transmission fluids more evenly distribute heat because they are more homogeneous at a molecular level and resistant to volatility. They also provide better viscosity and resistance to break down under high pressures. This prevents the premature wear and tear that once disabled transmissions. Transmission fluid coolers act similar to the radiator that cools your engine to extend the life of transmissions. A manual transmission typically requires gear oil changes at intervals. The intervals may reach 30,000 miles or more, depending on the quality of the lubricant recommended by the manufacturer. A manual transmission is more serviceable. The clutches and gears are far less complex than those assembled in an automatic. Owners prefer manual transmissions for the crispness of the shifting control, typically improved fuel economy, and rugged durability. There are many other types of transmissions hitting the market as technology improves. Continuously Variable Transmissions (CVT) are becoming popular for the smoothness of the shifting. However, some feel that the shifting is too smooth and miss the drive that a gear set ranges their mobility within. As a result, many luxury and performance automakers are switching to multiple gears of 8 or more to provide smoothness without sacrificing the driving force that a gear set can influence. Your vehicle needs multiple gears only because of the manner that gasoline engines output power in varying ranges of the RPM powerband. Electric motors only require one gear because the powerband is predictable and linear the entire span. Most of the service we perform today is computer-related diagnostics for the electronic components of your transmission, adjustments, calibrations, and replacement of clutches or units. If your transmission is slipping, hard shifting, or making any noises, call us as soon as possible to prevent a catastrophic failure.